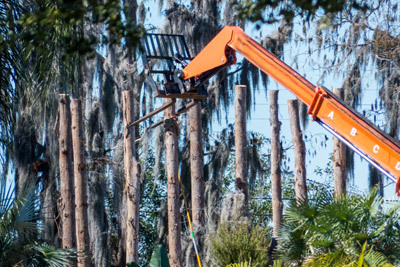 Residents in an east-side Sun City Center neighborhood report that workers have said that work on one home, along with creating what appears to be a dead forest, is related to an upcoming film by director Tim Burton. Filming will take place in the Tampa Bay area through March 7. Mitch Traphagen photo. According to the Hillsborough County Film and Digital Media Commission, along with reports from The Tampa Bay Times, filming for a new movie by director Tim Burton is expected to begin in parts of Hillsborough and Pinellas counties this week. The Times reported the name of the film as Miss Peregrine’s Home for Peculiar Children. Burton, 56, is a famed director known for dark and often quirky horror and fantasy films, including 1988’s Beetlejuice and 1990’s Edward Scissorhands. He has also directed two Batman films as well as the 2001 film Planet of the Apes. Earlier this month, notices were provided to homeowners in Sun City Center about upcoming activity involving an unnamed film. According to reports along the eastern side of the community, work has begun on one home and along a golf course fairway, creating what appears to be a dead forest. Residents have reported workers stating they were involved with the Burton film. Filming is expected to take place in the Tampa Bay area through March 7.